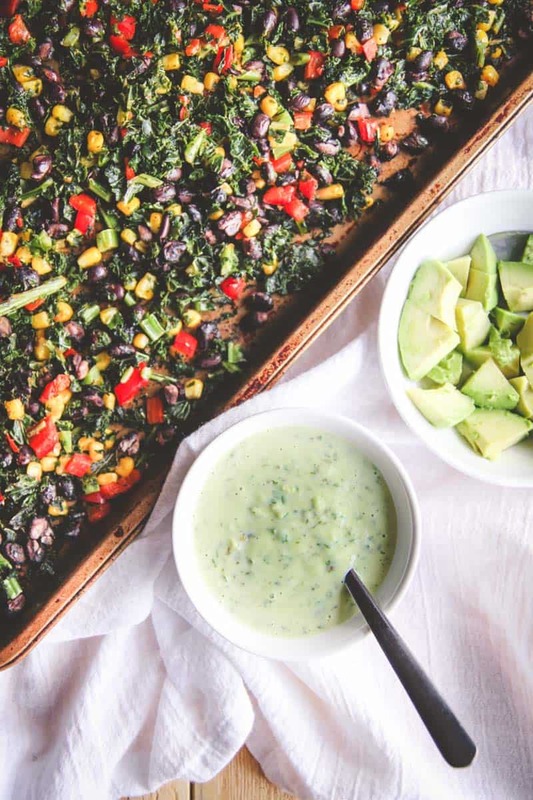 Happy Meatless Monday – this vegetarian sheet pan dinner of a Mexican kale salad is going to be your new favorite super easy dinner to prepare. The meal came together so much better than I could have hopped for. It was so delicious, and I added some tortilla chips which added a nice little crunch. It was a bowl of deliciousness and I loved how easy it was to make. 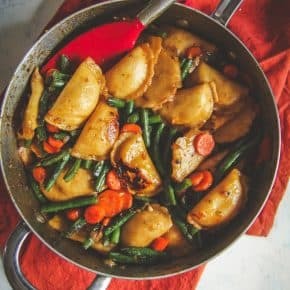 So of course I made it a again, and then again, and finally was like ok, I need to share this recipe- it’s an awesome sheet pan dinner (or do you say sheet pan supper?) and is great for vegetarians and non-vegetarians alike. It’s super flavorful and sooo good! This recipe makes two big salad bowls, or four small ones if you’re eating something else on the side. 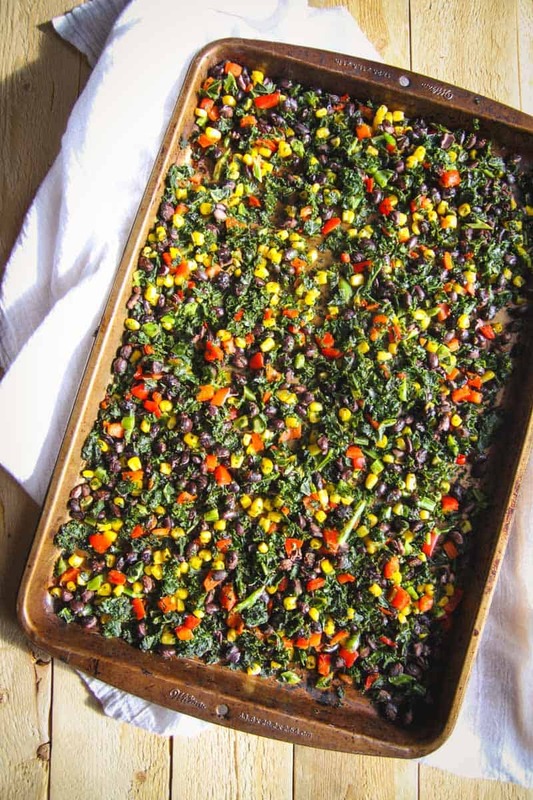 Place kale, corn, pepper, and black beans on a baking sheet. Drizzle with olive oil and sprinkle cumin, paprika, cayenne and salt on top of vegetables. Bake for 15 minutes, then remove from oven. 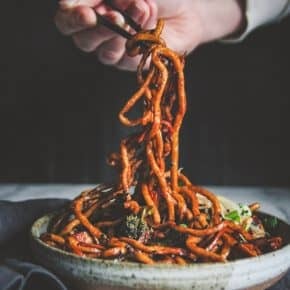 Meanwhile, make the sauce - in a food processor combine avocado, cilantro, lime juice, yogurt, water, salt, chili powder and cumin and pulsate until smooth (about 20 seconds), transfer into a bowl. 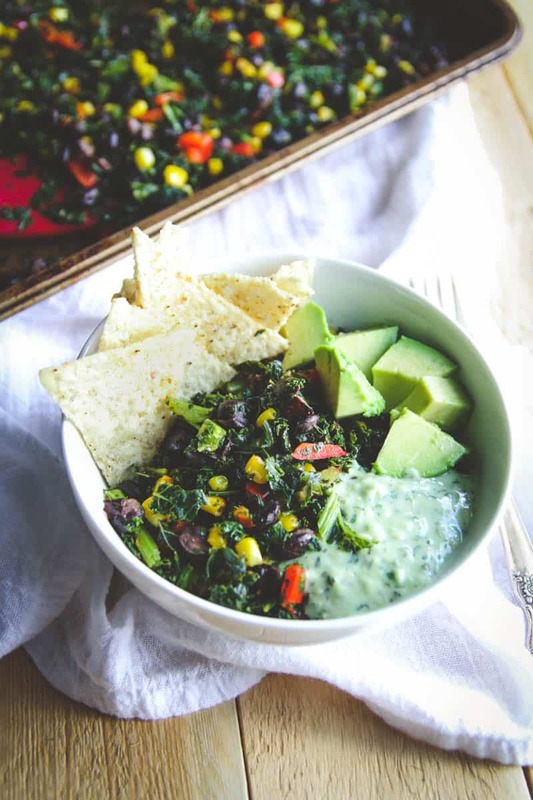 To assemble the salad put 1/2 contents of the sheet pan into a bowl, top with 1/2 of the remaining avocado (1/4 of an avocado) and tortilla chips. Spoon dressing on and enjoy! Salad in a sheet pan!! I loveeee that idea 🙂 This salad is gorgeous, too. Thank you so much! 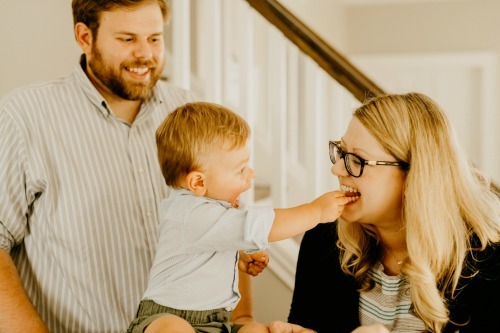 It is such a great (and quick) way to make dinner!! 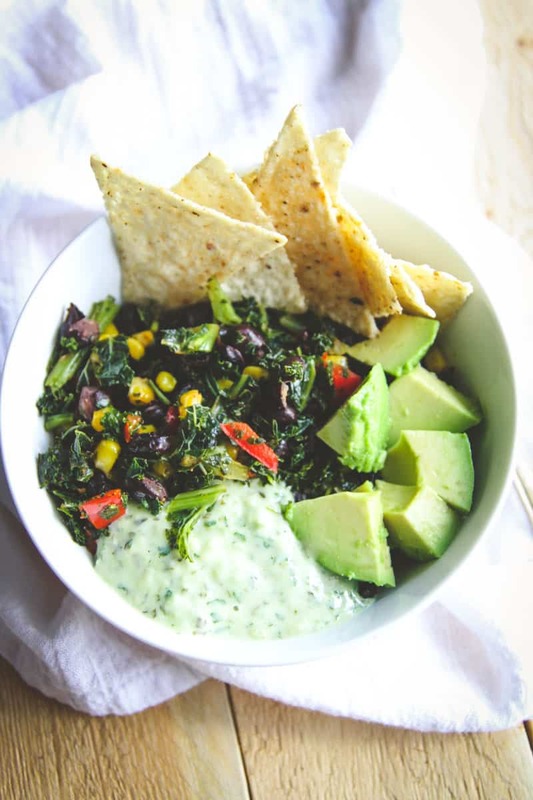 I love kale and I love Mexican food, so putting them together is like a dream come true for me. I love all the colours as well. hey girl this looks so good! You are a lot like me! Just throw things together be creative! yummy! YES! I am exactly that way (throwing things together to be creative with dinnertime) and am so glad you like the looks of this salad – it’s become one of my favorite dinners and I’m totally making it again this week lol! This was so easy and a big hit. 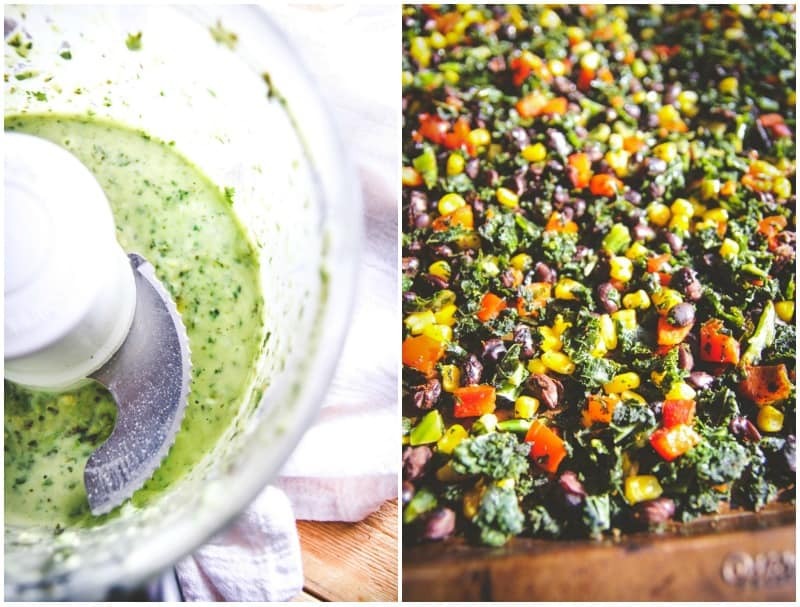 I used fresh kale and couldn’t find Mexican frozen corn so I used frozen corn and fresh red and green peppers. So delicious. Will definitely make again! Thank you! !